Bowling is a sporting activity in which players attempt to score points by rolling a ball to knock down target objects. Bowling has been popular for hundreds of years, with different variations taking hold in Europe and North America. It may date back as far as Ancient Egypt. The game is popular for its competitive, yet socially friendly, atmosphere and relative simplicity. There are many different forms of the game in various parts of the world. The most popular form in North America, and globally, is Ten-Pin Bowling, the type of bowling associated with the World Tenpin Bowling Association, an internationally recognized professional sports federation. Other forms, such as ninepin, candlepin, and lawn bowling, are still popular games around the world. There are many claims to the origins of bowling. The International Bowling Museum suggests that bowling might date as far back to 3200 B.C.E. in Ancient Egypt, with more recognizable forms emerging in Germany in the fourth century C.E. and in England in the fourteenth century. Bowling was, undoubtedly, one of the more popular games brought to the British colonies in America, where it transformed from the more traditional game of ninepins into the modern-day tenpins format. The commercial market for bowling took off in the United States in the late 1940s, with the growth of the American Machine Foundry (AMF, Inc.), which developed the first automatic pinsetters. Professional leagues and televised matches took off from this point, helping propel bowling into the popular competitive and social activity it is today. Ten-pin bowling, the most popular form of bowling, is played indoors on a flat, wooden or synthetic surface, usually covered with oil to reduce friction. A regulation bowling ball is no more than 27 inches in circumference. A regulation bowling pin is 15 inches tall and weighs between 3 pounds, 6 ounces and 3 pounds, 10 ounces. A regulation lane is 60 feet long and 41 to 42 inches wide. Ten-pin bowling pins and ball. Five-pin Bowling. Played in Canada, this form of bowling uses only five smaller pins and a small rubber ball. The five pins are arranged in a V-formation. Nine-pin Skittles. This is a variant played in Europe and is the form from which Ten-pin bowling evolved. The nine pins are arranged in a diamond. Candlepin Bowling. This variant is played in Canada and New England, with thinner pins that are shaped evenly at the top and bottom, and with smaller bowling balls. Cocked-Hat Bowling. A game popular in Germany and other places in Europe, this form uses a smaller ball and only three regulation-sized pins. Duckpin Bowling. A popular game in the eastern parts of the United States and Canada, using shorter, fatter pins and a smaller ball. Feather Bowling. A Belgian game similar to Italian bocce lawn bowling, in which oddly shaped bowling balls are thrown toward a feather, the object being to end one's roll closest to the feather. Lawn Bowls. Popular in the United Kingdom, Australia, New Zealand, and Canada, the game is similar to bocce. Players roll asymmetrically shaped balls (called “bowls”) towards a small, white target ball (the “jack” or “kitty”). Bocce. In this popular Italian lawn game, players roll spherical bocce balls to try and end up closest to a small white or yellow target ball (called the “jack” or “pallino”), knocking out an opponent’s ball if necessary to get closest. The player who rolls closest to the target is awarded points. Petanque. Originating in southern France, this game features metal balls (called “boules”) which players roll toward a small wooden target ball (called a cochonnet). The game is usually played outside on dirt, grass, or gravel, and has similar rules to bocce. A player at ten-pins bowling. In Ten-Pins and several other types of bowling, games are arranged in sets of ten "frames." Each frame consists of two chances for the bowler to throw. The player is awarded one point for each pin that he knocks down. However, if a player knocks over all ten pins on the first throw, this is scored a "strike" and the player is awarded ten points plus the quantity of his next two throws. If a player knocks over all ten pins on two throws, this is recorded as a "spare" and the player is awarded ten plus the quantity of his next throw. The tenth frame consists of two normal throws, plus a bonus roll if the player scores a spare or two bonus rolls if he scores a strike. A player can therefore record three strikes in the tenth frame, unlike other frames, in which he could only score one. A perfect game in bowling is a score of 300, consisting of 12 consecutive strikes. Scoring was done largely by hand until the 1970s, when automated scoring systems were put into place at many commercial bowling alleys. These computers read the number of pins left standing in the lane and score the games accordingly. In bowling leagues, players are generally awarded a handicap, which is a number of points automatically designated to a player based on his or her scoring average. Over the course of many games, a player’s average is determined, and to balance the playing field, players are awarded handicaps to level the averages. Bowling with handicaps is a strategy to determine how a player bowls versus his average game, rather than by gross score. Fouls may occur in bowling when a player crosses the foul line at the base of the lane as they release the ball. If a player crosses the line, a foul is recorded as “F” and the player continues with their frame. If it occurs on the first attempt, ten pins are then positioned for the second attempt. If it occurs on the second attempt, the player is only awarded the score from the first throw, and the frame is then completed. Generally, fouls are monitored by electronic sensors at the base of the lane. However, in some forms, fouls must be recorded by other players or a judge. There are several variations on the scoring of Ten-Pin bowling. One form is Low-Ball, in which players attempt to score the least amount of points by aiming for just one pin (the seven or the ten). 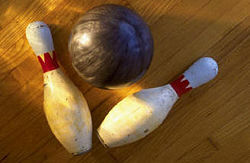 Games are scored just as normal bowling, with the exception that "gutter" balls (see below) are always recorded as strikes, and if a player throws the ball on the second attempt and does not hit any pins without going in the gutter, this is recorded as a spare. Therefore, a perfect game of Low-Ball Bowling would be a 20, one point for each attempt throughout ten frames. Outdoor bowling, of which the most popular form are Bowls (or Boules) and Bocce, typically takes place on a wide, flat patch of open grass, although it is sometimes played on dirt or gravel. Players are divided into teams, and they pursue the objective of tossing or rolling the ball toward a target object, often a small white or brightly-colored rubber ball. Similar to horseshoes, the players' goal is to stop the ball closest to the target object, and points are awarded for the best attempts. 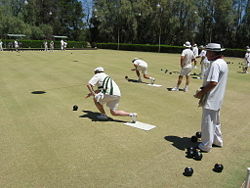 All the players throw from the same distance or tossing area, and the target is continually replaced about the playing surface (often called a "bowling green") until a final determined score is reached. Frame: A unit of scoring measurement throughout the game similar to an "inning" in baseball. In ten-pin bowling, there are ten individual frames, which consist of two attempts each. A frame is completed either by scoring a strike on the first roll, or after throwing two attempts, whichever comes first. Strike: Knocking down all ten pins on a player's first attempt in a frame. Spare: Knocking all the standing pins down on the second attempt. A spare is recorded with a “/” and the player is awarded ten points plus the quantity of his next throw for that frame. Mark: Either a strike or a spare. Open frame: The opposite of of a mark, when a player fails to score either a spare or a strike. Foul: Stepping across the foul line while throwing releasing the ball. Gutter Ball: A ball that goes into the gutter on either side of the lane, scoring zero. Split: A combination of pins left standing with a gap between them. Splits do not include the head (“one”) pin. They do not affect scoring, but are acknowledged on the scoresheet to acknowledge a difficult spare attempt. The hardest slit to convert is the seven-ten split, which involves the two back corner pins only. Beaver: in nine-pin bowling, when a player does not knock down any pins. Flopper: in nine-pin bowling, the equivalent of a "strike." Cheese: a term referring to the bowling ball, which is sometimes made of wood and shaped like a wheel of cheese. Skittles: nine-pins is sometimes called "skittles," a term probably derived from the sound of the wooden pins falling over. Magnet: a gap in the pins in skittles, similar to a split. It is called a magnet because it seems to attract the ball. The World Tenpin Bowling Association is an international organization that oversees the rules, qualifications, and rankings of professional, semi-professional, and distinguished amateur bowling championships and federations. It was formed as part of the Federation International de Quillers (FIQ) in 1952. The WTBA oversees the designation of the World Ranking Masters, an international professional bowlers ranking system. The Professional Bowlers Association, otherwise known as the PBA, is a competitive bowling league for professionals. It was formed in 1958 by Eddie Elias, an attorney from Ohio. Formats for PBA events typically are played in 64-person tournament format, with head-to-head matches leading to a final game. Players typically alternate lanes in these matches, and prize money is awarded to the top finishers in an escalating format. The United States Bowling Congress is an amateur bowling organization formed in 2005, by the merger of many previously existing bowling organizations in North America. The USBC oversees many amateur bowling leagues and tournaments. The British Tenpin Bowling Association is the United Kingdom governing organization on ten-pin bowling. It was formed in 1961, and produces the official rules for ten-pin bowling in the British Isles. The BTBA oversees the Premier Tenpin Bowling Club. The Premier Tenpin Bowling Club is Britain’s version of the PBA. Bowlers compete for championships and prizes in a similar format to the PBA. The European Tenpin Bowling Federation is a governing organization on ten-pin bowling in Europe and runs the European Bowling Association tour. The European Bowling Tour (EBT) is similar to the PBA and, along with the Asian Bowling Federation, competes internationally for the World Tenpin Bowling Association’s World Ranking Masters championship. United States Bowling Congress. www.bowl.com. British Tenpin Bowling Association. www.btba.org.uk. Premier Tenpin Bowling Club. www.ptbc.co.uk. This page was last modified on 22 June 2016, at 15:31.